Defend Our Coast, Victoria B.C. On Sunday, I headed up to Victoria, B.C. with two other activists from the Cascade Climate Network. 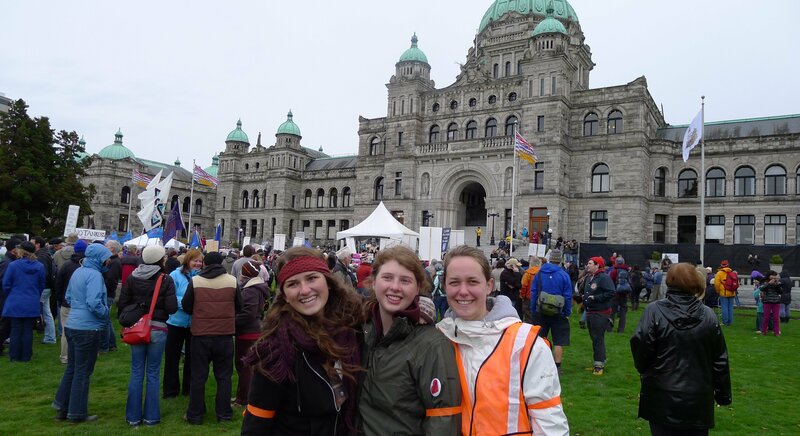 Little did I know that participating in a 5,000 person action to Defend the Coast from tar sands pipelines and oil tankers would continue to build momentum over the following days in many different capacities. I am truly inspired by my experiences of the past few days and wish to share them with you. In the weeks leading up to the Defend Our Coast action on the BC legislature lawn, I kept checking the website. Originally the organizers set the participant goal at 2,000. Soon the numbers of people who pledged to participate exceeded 2,000 and new goals of 3,000 and 5,000 had to be made. The day before the action, more than 4,500 people had signed up to participate in the action in some way. Many people pledged to participate in civil disobedience by staking a 235 meter (770 feet) black banner, which symbolized the length of an oil tanker, into the lawn of the legislature. The Monday Defend Our Coast rally was by far the largest action against tar sands ever in Canada’s history. Upon arriving in Victoria, we took a bus up to the University of Victoria to meet up with others and receive training to prepare for the next day. I was fortunate to meet the director of the Backbone Campaign, Bill Moyer, and hear about the great work they do. The Backbone Campaign is a group that does creative tactics across North America. Here is a photo of their pre-action fun from Sunday night. The First Nations peoples who were present at the training clearly articulated the importance of defending the land we have grown up on for many, many future generations to enjoy. There were elderly in their 90s who were there in support and were clearly participating for their offspring and the non-human animals who do not have a voice in political processes. 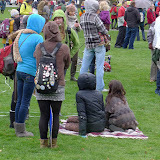 Amanda Maxwell, the Oregon Cascade Climate Network Co-director stated, “Having the opportunity to see people from all walks of life come together to protect our future is inspiring. The issue of fossil fuel dependency is bigger than just us; this is about safeguarding the future for generations to come.” This sentiment was definitely held by many people who showed up to be part of the action. On the day of the action, people from all over emerged out of the woodwork to join in solidarity on the lawn of the legislature. 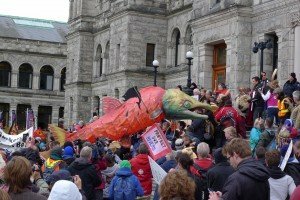 The crowd included babies, elderly arriving by bicycle, First Nations peoples with drums, dogs and stuffed animals with signs, and this large salmon puppet provided by the Backbone Campaign (left). Throughout the day, various speakers and performers sent their messages out into the crowds of applause on the main stage. Thousands of people were willing to risk arrest in order to stake the model tanker into the ground, but no one in the end was arrested. The messages were sent loud and clear with words, through song and dance, and by leaving painted messages on the tanker that was staked into the legislature lawn. The police even aided in the action by closing off the road for the end of the tanker to extend into the street. Bill Moyer, Director of the Backbone Campaign, described the Defend Our Coast rally as, “a pivotal moment, a milestone in an unprecedented process of coming together to occupy our vision, our aspirations and our power to shape the future.” In just the past two days since the initial rally, it has become clear that it really was a pivotal moment that has continued to grow. 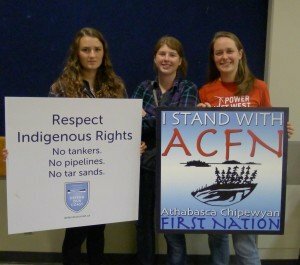 In conjunction with the October 22nd Defend Our Coast action, the Athabasca Chipewyan First Nation (ACFN) filed a lawsuit that would prevent tar sands extraction at the source in northern Alberta. To find out more and stand with ACFN against shell, visit the Stop Shell Now site. 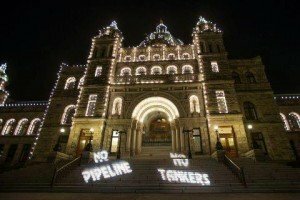 After an incredibly exciting weekend filled with standing in solidarity with activists from many nations in the thousands at the BC legislature, the public push against tar sands continues to escalate. The domino effect has begun. Today, October 24th, people went to the offices of their representatives in over 68 communities across British Columbia to rally against tar sands. Over 5,000 people of all ages turned out in total at the various locations. To read more on the story, visit the main Defend Our Coast website or follow the media streaming in on facebook at facebook.com/DefendOurCoast. 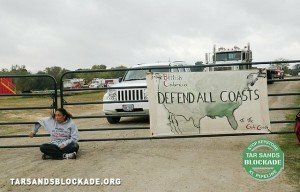 As I searched for more news on the continued actions related to Defend Our Coast, I also came across updates on the Tar Sands Blockade, which is a group of activists based out of Texas that is fighting the Keystone XL tar sands pipeline. The Tar Sands Blockade in Winnsboro, Texas celebrates its month long anniversary today. Activists have been living in the canopy of a forest that would have to be bulldozed in order for the Keystone XL Pipeline to be built for a solid month now. If you wish to make a donation in support of the direct action efforts, please click here to donate. I was also incredibly inspired as I came across the story of Cherri Foytlin’s arrest in Louisiana. Cherri Foytlin, an indigenous mother, blocked the TransCanada Keystone XL pipeline construction trucks for an hour. She took action to have a direct impact on the construction of the pipeline needed to transport tar sands from Alberta, Canada to the Gulf of Mexico through many communities and important clean water aquifers. Watch Cherri Foytlin’s tar sands blockade testimony video or follow the blog about the action at http://tarsandsblockade.org/10th-action/. The past few days have been incredibly inspiring to me. Standing with thousands of people who care enough of about the land that we live on and the water that we drink to travel thousands of miles to convey the message that we want to give a healthy planet to future generations reaffirmed my commitment to doing everything I can to bring about a more thriving, just, and sustainable future for all. See the album below if you wish to view moments that I captured in Victoria, B.C. Thanks for the first-hand update Emma!